Direct reaction of the elements. Reaction of metal oxides or carbonates with a sulfur compound. Reduction of a higher sulfide. Reaction of a metal hydride with a sulfur compound. Reaction of a metallic halide with a sulfur compound. Materion employs all of these routes, plus proprietary developments, to prepare the one of the largest families of pure or mixed sulfides available. Many sulfides have melting points above those of oxides. Sulfides can either be salt-like (e.g., the alkaline earth sulfides) or hard-metal like (e.g., the refractory sulfides). Sulfides are generally hydrolyzed by water. Sulfides generally oxidize readily in moist air at ambient temperature or in dry air at elevated temperature. Some sulfides possess semi-metallic character and have potentially valuable electronic properties. Tantalum and niobium sulfides have low friction coefficients and can be used as lubricants for optical and sensitive instruments. Rare earth sulfides are semi-conductors and have been used in thermoelectric devices. Alkaline earth sulfides plus those of calcium and zinc are used for phosphor compositions. Molybdenum and tungsten sulfides are widely used, non-graphitic commercial lubricants. Numerous sulfides can be fabricated by various techniques (e.g., hot-pressing, isostatic pressing) without added binders to form dense bodies. Please contact our sales department for more information. Materion prepares a comprehensive selection of sulfides. Small lots are promptly available from stock for experimental or test purposes. Production quantities of many sulfides are also available from stock. Large amounts of other sulfides are produced to customer's specification for rapid shipment. Mixed sulfides (e.g., Li2S-FeS2), non-stoichiometric compositions or special purities and particle sizes can be custom manufactured. The wide variety of Materion sulfides available has resulted from the numerous and largely unrelated applications for these products. In many individual applications and with many individual customers, we have developed products specifically for existing or new applications. In fact, our product line has grown largely in response to customer requirements. Materion highly values these customer relationships and encourages any and all questions, comments and suggestions related to the performance of their sulfides in specific applications. 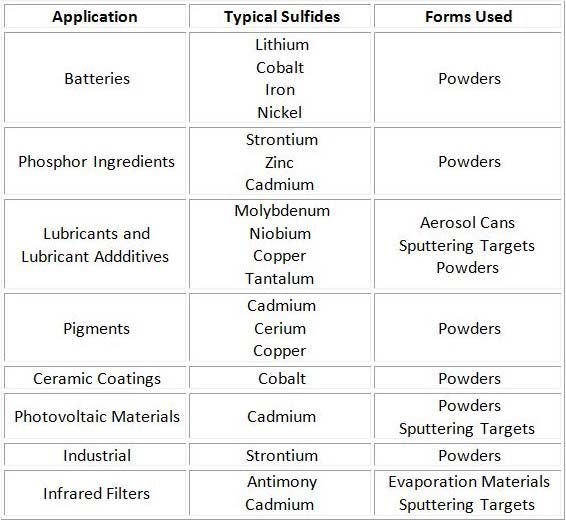 Table 1 provides a glimpse of some of the recognized sulfide applications and the type of Materion products suitable for use in each case. For example, phosphor, battery and pigment applications usually require fine powders while numerous thin film applications require the use of sputtering targets or evaporation materials. The scope of sulfide applications is continually changing and evolving. While zinc and cadmium sulfides have a lengthy history of use in cathode ray tubes, strontium sulfide has only recently become of importance in conversion of infrared radiation to visible light. Also, various sulfides have come under recent scrutiny as new battery materials, largely due to the relatively stable forms of metal sulfides in multiple oxidation states and to environmental acceptabilities. These battery developments extend from specialized military and industrial uses to evaluations directed toward the propulsion of electric vehicles. In summary, present and future sulfide applications are derived mainly from the diverse properties exhibited by this family of products. For example, many sulfides exhibit semi-metallic behavior, giving rise to electronic applications. Some are highly refractory, with melting points exceeding those of oxides, and are stable during thin film formation by vacuum deposition. Others have crystal structures and very high lubricities. * Melting points are much higher than listed, but no accurate measurements have been made. Note: Facts pertaining to properties and processing parameters of sulfides were derived from published literature sources. Although this information is believed to be correct, Materion does not guarantee its accuracy.